I bought a bag of fresh cranberries a week ago and hadn’t used them yet. 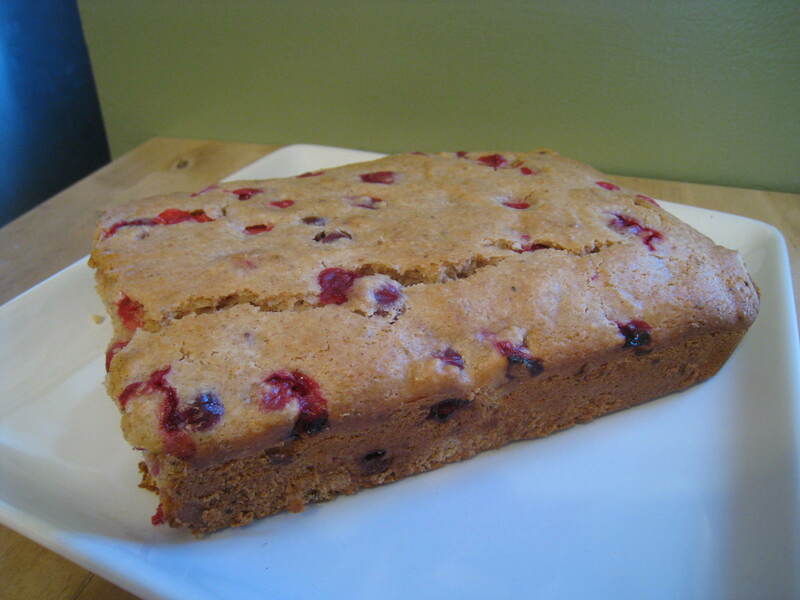 I had made cranberry bread before, but wanted to try a new recipe and see how they compared. Preheat oven to 350 degrees and spray a loaf pan with cooking spray (or 4 mini loaf pans). In a large bowl, add sugars and oil and mix until very well combined. Mixing while incorporating, add milk, zest, egg, and vanilla. Mix to combine well. Spoon batter into loaf pan(s) and tap to release air pockets. Place pan(s) into oven and bake until toothpick inserted into center of loaf comes out clean, about 50-55 minutes for regular loaf and 25-30 minutes for mini loaves. Remove from oven and let cool in pan for 15 minutes. Turn loaf out onto wire rack and let cool completely before slicing.